Maybe you don't want to build a keezer. After all, it is more expensive and you have to do a little woodworking – not everyone's cup of tea. Plus a lot of guys have an old fridge in the garage just itchin' to be turned into a kegerator. Like my buddy Forrest. Watch the video below where us knuckleheads convert his fridge into a kegerator. What did ya think of the video? Pretty simple, right? Once you have the parts in hand the build itself is really a breeze. Here's what you need. Any other bells and whistles, like a “Tee” or CO2 manifold if you want to run gas to multiple kegs. Don't rush into drilling the holes in your fridge. 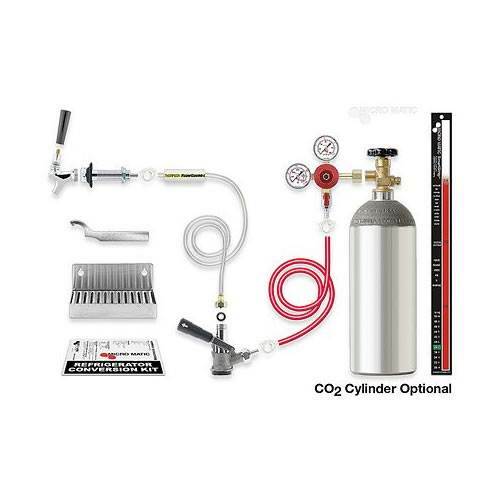 Take the time to plan out everything – where you want your tap handles, how many you want, where you will keep your CO2 tank (outside or inside), and what lines you will have running into the fridge. Most people put their taps on the door but you may want to go in through the side. Or even if your taps are on the door, you may want to drill a hole in the side for your CO2 line. Search online for the schematics of your fridge. They should show you where the coils are. You're almost always safe drilling through the door. Just be careful of wires if you have any electronics on the door (like a digital readout). Search for the model number on Google along with “kegerator.” Someone's probably converted it before. Spread a mixture of cornstarch and alcohol on the ridge. Then turn it on. The mixture will dry the fastest where the coils are. Drill a test hole on the inside first – just enough to crack the plastic. Then take a nail and poke around for coils. We drilled using a 1-1/8″ hole saw, similar to this one . The manual says what size to use. If you have a freezer compartment above your fridge, factor that in when you're placing your tap handles. It's really common for brewers to accidentally block their freezer door with tall tap handles. The thing I like about this project is that you can ease into it. You can still keg your beer and use the fridge without having to go through all this efforts. You would just use a picnic tap and open the door to the fridge every time you want a beer. Then, when you're ready, you can do this conversion to add the tap handles. Hooray for draft beer at home! Thanks bro. Just bought my conversion kit online so it’s perfect timing. I have a new fridge though, so I’m going to try to be more careful cutting those holes! Hey Nathaniell, have fun with the build and yea, definitely take your time on a new fridge. We didn’t really give a damn about getting rough on this old one (as you could tell). Hi how did your conversion go? I am just getting ready to do this. Thanks for the help. This look really cool and I want to do something like this soon. If your co2 tank is outside the fridge how does it being a warmer temperature affect the pouring of your beer? What interior dimensions are required to use Corny kegs? Billy that’s a tough one to answer because it depends on so many factors. How many corny kegs, their capacity, the brand you use (they’re shaped different). My advice is to get your corny kegs first, measure them, then find an appropriate chest freezer. Make cardboard cutouts of the corny keg bottoms (i.e. their footprints) you can take to the store to test on the freezers and figure out how many will fit in different sized freezers. I went through the same process Billy mentioned below. Buy, then measure then freezer and build. Worked well for me. Any way to make the fridge run colder than normal. Since I have a keg and beer in the fridge I would love if I could get it down to 28 degrees. Most fridges run between 35 to 40. This is a fun project, and I appreciate the simplicity of your guide. I followed another guide that involved installing a collar on the lid with wood trim and it was extremely difficult. I like the project. I have a regular fridge at the campground inside my shed. Can’t wait for next spring to do this. Just how long does a keg last without loosing its taste? Any lost? If so, how much?